I’m sure you have seen these adorable appliqued shirts out there. The tie onesie is a design I have made over and over for my son, and for gifts for friends. It is quick easy, and oh so cute! When my daughter was first born I was always looking for cute horse clothes for her and never found any. They were either tacky, or seriously expensive. 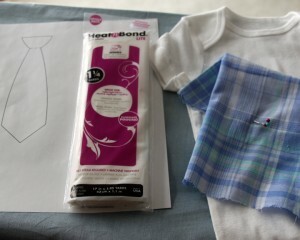 I began making appliqued shirts for her that were adorable and very very inexpensive to make. Here is how you can make your own. Cut your graphic out of the paper and lay it onto the Heat n’ Bond paper. I do this to measure how much Heat n’ Bond I need so I don’t waste it. Turn your iron on and let it start to get hot while you do this step. Read the package directions for the Heat n’ Bond to decide what temperature to set the iron. After you have your Heat n’ Bond cut, place it smooth side up (sticky side down) onto the back of your fabric (the side without a pattern) if it is one-sided. I used the sleeve old shirt for this project. 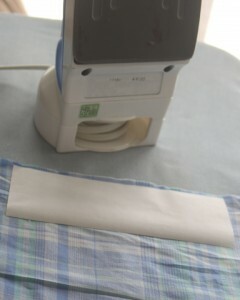 Next iron the fabric to the Heat n’ Bond. This only takes a few seconds and I always check to make sure all of the edges are bonded before I move to the next step. 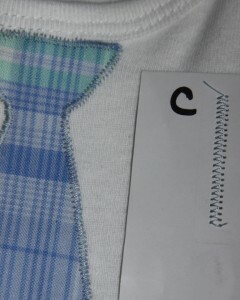 Next cut your appliqued shaped from your cute fabric and flip it over leaving the backing attached. 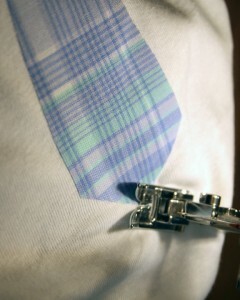 Place your tie pattern onto the fabric (with applique ironed on the back) and adjust into place. Use pins to secure the tie where you want it. 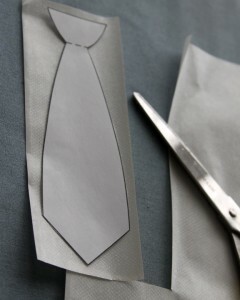 Cut carefully around your tie pattern. Peel the backing off of your little tie and you have made an applique tie! The back of your tie is now all ready to be ironed to your shirt. Position your little tie where you want it on the shirt. Make sure it is centered and straight. I place a thin towel over it before I iron. This is to make sure you don’t leave any burn marks on the shirt. This is necessary, especially when using light colored fabrics. Hold iron onto towel making sure you are covering your applique design, and you are done. 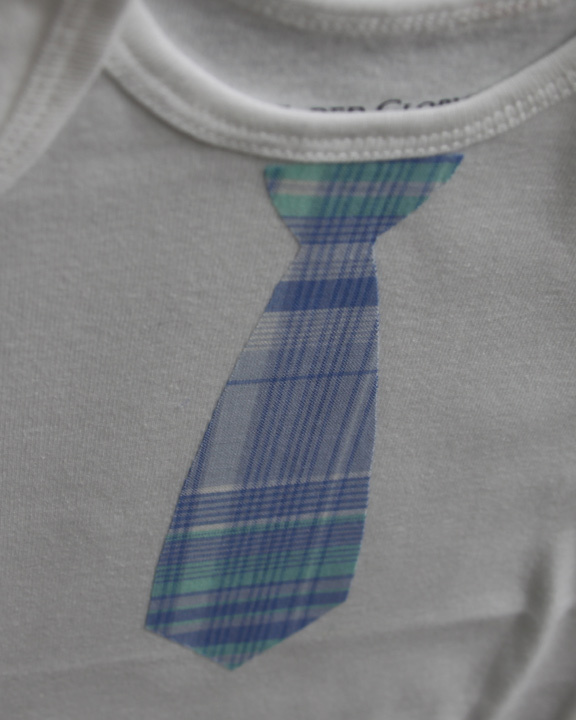 A perfectly simple and adorable tie for any little mister in your life. 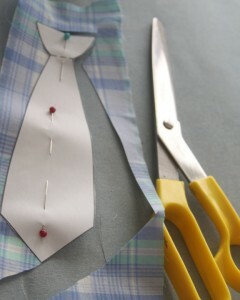 Next it is time to get out your sewing machine to finish the tie off. 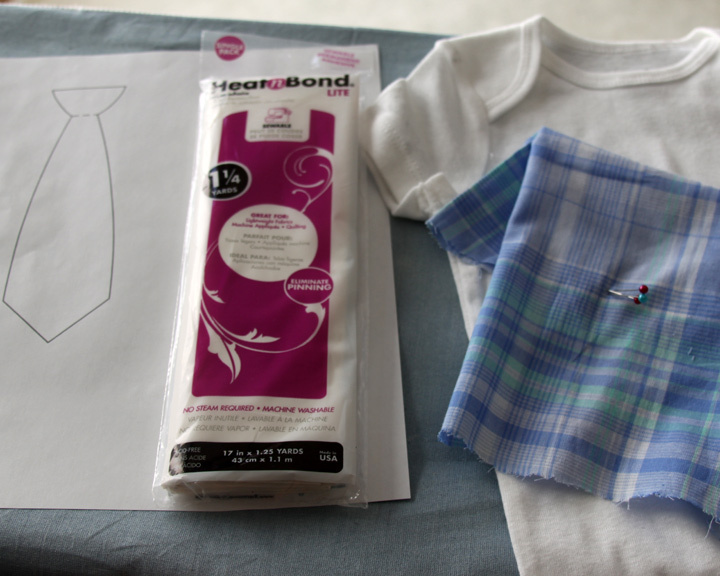 Note: If you choose not to sew – you can buy a non-sewable applique material that does not need to be attached with sewing and is still washable. All you need is your machine, and the thread of your choice. 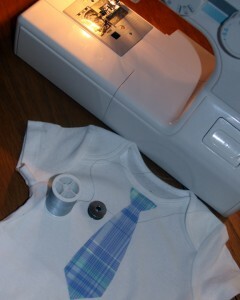 I chose a light blue thread to match the plaid tie. I set my machine to a zigzag stitch (C-1st dial) – about 1/2 inch (2nd dial). 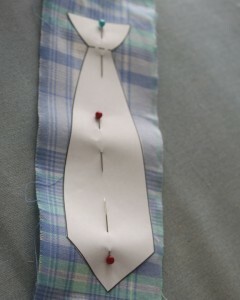 I find this stitch a little more forgiving then others and it gives a neat trim around your tie. You can certainly use a straight stitch as well if you want the frayed edges look. I start at the tip of the tie and keep the edge of the tie in the center of my sewing foot as my guide. 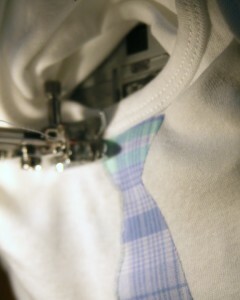 This way I get a nice straight stitch that borders my design. When I get to the end of one straight line I lift the foot and turn the shirt so my foot is heading down the next straight line, and do so for every corner of the tie. When I get to the end I do a little back stitch to secure and cut off all of my thread pieces and – Done! 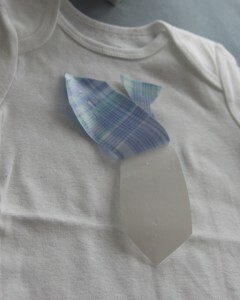 I love these as gifts for new babies and think they are great for picture day! I hope you give it a try! This example is one of the simplest to make. I think you can make anything using this technique. 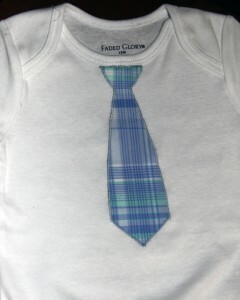 I will show some more examples of my shirt creations soon! This is really cute! I like how the zig zag stitch looks around the edge. Where can I find a printable picture of the tie graphic?